After being awake for 36+ hours from traveling and exploring our first day in London, we were more than excited to snuggle in bed and get some sleep. We had a busy second day exploring ahead of us! First up on the agenda was Westminster Abbey. We hopped on the tube bright and early with the other commuters. The tube was such a fast and convenient way to get around. A train came every 90 seconds. Although it would be packed with locals each morning and was a bit hot on there, we were never on a train for more than 10-15 minutes. It made getting around town so easy! However, our day took a slight detour and we had the most unexpected and exciting event ever. When we got off our train and came up the stairs, we were immediately greeted with tons of metal gates and police blocking off the streets. As we walked across the street to get to Westminster Abbey, we didn’t think much of it. We thought that since Big Ben, Parliament and Westminster were all on the same street corner that this was a normal occurrence. Soon after we saw a procession of black cars each with a different country’s flag on the front. After some google searching we found out that Parliament was opening that day. No big deal, right? Oh contrary my friend. As we were making our way over to Westminster, we asked a House of Parliament worker what exactly was going on and she told us the queen was going to be opening Parliament that day and she’d be coming down the street in about an hour. SAY WHAT!? 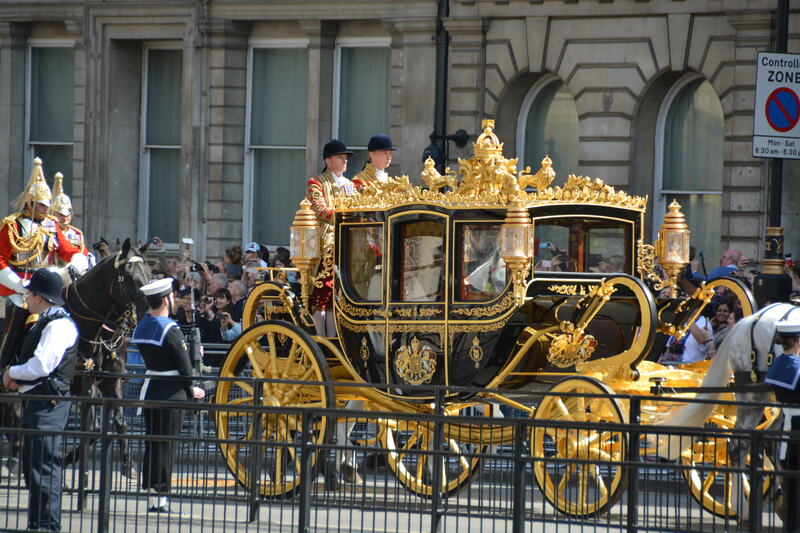 On the few days we were in London, we might actually get to see the Queen!The princess in me was pretty darn excited. Since there was still time before the Queen made her arrival, we quickly buzzed through Westminster Abbey. We literally ran through the entire cathedral in under 30 minutes because I was too darn excited to see the Queen. Westminster Abbey is stunning. I loved seeing it in person after getting up at the wee hours of the morning to watch William and Kate get married in it. Ever since we went to Italy, I’ve become infatuated with European Cathedrals. The intriquite woodwork, beautiful stain glass windows and history of those who have been there before just fascinates me. After that we headed outside to try and spot the Queen. The police told us that they didn’t know which way she would be coming so we just kept a look in all directions. Pretty soon tons of horses and carriages started making their way down the street. It was such a sight to see! It really was a grand event! The Queen even was sporting her tiara which I about died after seeing on her head. We also spotted Princess Anne, her daughter which I never knew she had. Prince Charles and Camilla were apparently behind the Queen in a separate carriage but I was too carried away watching the Queen to even notice. 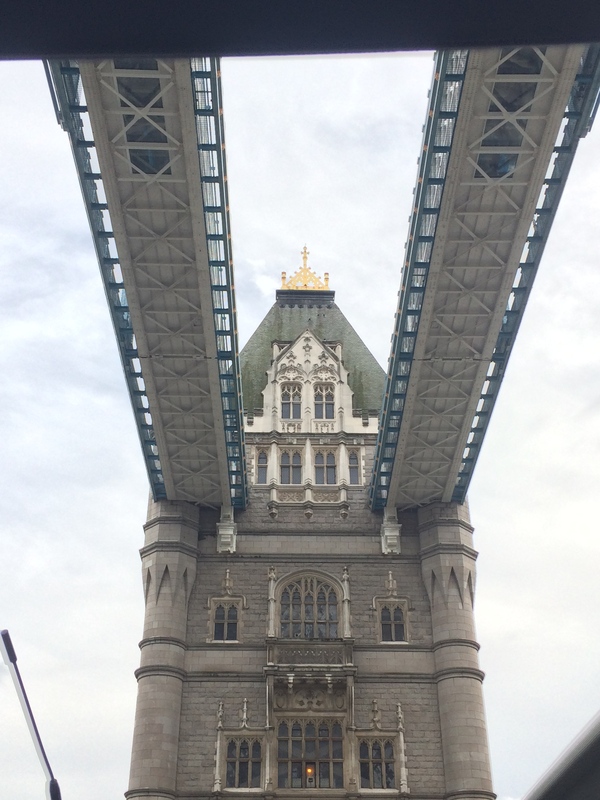 We’re still pretty excited that we got to see the Queen in all her glory while we were there. A few local people told us they’ve been there for years and have never even seen her! So after all of that morning excitement, we headed over to the Churchill War Museum. It’s an underground war bunker that Churchill used to use. While I’m not a huge history buff, it was neat to learn about what happened down there and see items from that time. To round out our day, and give our feet a rest (we walked 10+ miles everyday! ), we went on a tour via mini cooper with Small Car, Big City. We had someone drive us around for 2 hours and she showed us some of the best sites around town. And so that ends a busy day 2 in London. We had tired feet (again) at the end of the day and were looking forward to exploring more on day 3!